So I'm a sucker for chocolate and peppermint. Sue me. I would rather die than go anywhere or purchase anything on Black Friday, but holing up in my kitchen or dragging out the art supplies is another matter. And my mom started a tradition, way back when, of always making some sort of special treat or cookie on tree decorating night. I come by it naturally. There were many other things I should have been doing yesterday, but I spent a good portion of it getting ready for Tree Decorating Night. Vacuumed the rug, hauled out the plastic tote marked "Xmas," and had to go to two stores to get the ingredients for these little numbers. I was doing it all for Wyatt. Really. He goes NUTS over chocolate and peppermint. Like I've said before in your presence, there's nothing quite as motivating as seeing your kids love something you make. Wyatt really goes for it, too. He rolls his eyes, groans, get chocolate everywhere. It's pretty great. I'm keenly aware lately that these are the moments I will miss and romanticize as I grow older and into different seasons of life. Don't get me wrong--I'm dying to go to Greece and Morocco, sleep in every once in awhile, and actually get something accomplished during my day. But all of that is overrated. These moments, unwrapping all the Chrismtas ornaments or cleaning up the playdough, are the real ones. I'll miss the physicality of the kids' little limbs, the completely un-self-conscious way they love things like Christmas lights and peppermint bark. This is it, and it's breathtaking. I am blessed beyond belief. Adapted from Bon Appetit. I used to be down on BA after Gourmet went under. I didn't want to like it. But guess what? I can't help myself. The December issue got me out of a kitchen stupor. All of the sudden, I want to attempt everything and travel everywhere. And that inspiration is totally worth the subscription price. P.S. I get chocolate for stuff like this at Trader Joes. Their "Pound Plus" bars are the deal of the century. And apparently white chocolate is totally passé. So 1984. I actually had to look pretty hard to find some. I settled for a Godivia bar from the grocery store. I suppose you could go without it, but I like the contrast and the way it binds everything together. Line a large baking sheet with foil. Stir bittersweet chocolate in a medium bowl set over a saucepan of shimmering water until melted. Stir in 1/4 c. chopped candy and all the crushed cookies; spread mixture over foil till it's about 1/4 " thick. 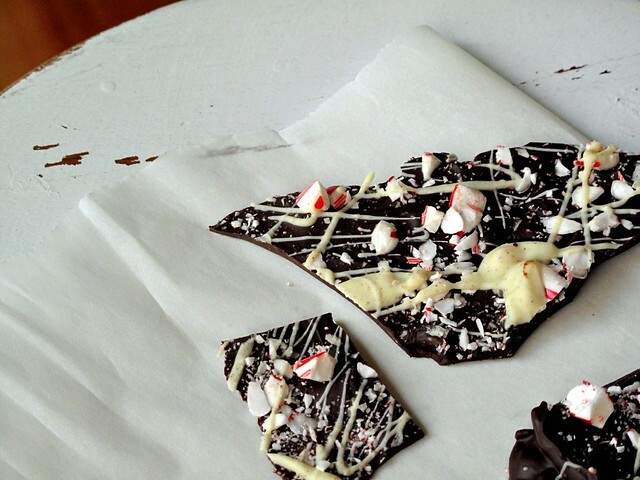 Sprinkle the rest of the candy over, and drizzle with the white chocolate (which you've melted in the same manner as the bittersweet chocolate). Chill until set, about 30 minutes, and break into shards.